I am working on a project for a class that I have this Friday (I will post it after the class) and I used these new paper pens. Oh my goodness they are so fun and easy to use. One tip that Susan gave Selma was to put the dots on the craft mat, let them dry and them glue them onto the project. This way there is no mistake. I would be awful to ruin the project you have worked on for several hours. This was perfect for me. I made several sizes and then could decide which size was best. The first project I did, I didn't do that and I was not completely happy with the dots. I can see all kinds of projects these will be good for. Paper Pen is creamy in texture and comes in 24 lustrous colors. 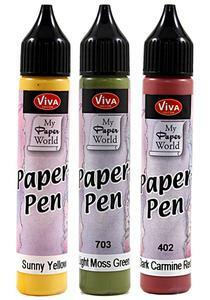 Paper Pen is specially formulated to create perfectly round, three dimensional beads of all sizes. The easy to use tip allows precise control and no clogging. Perfect for creating free hand beads or can be used with stencils. Paper Pen is an easy to apply water based acrylic. Includes 3 25mL tubes in Light Moss Green, Sunny Yellow and Dark Carmine. Can't wait to see how these work!! I have these and they work amazingly well. Love them! !